The poet – an elusive figure whose voice demands to be heard; a visionary with ideas that challenge the status quo. But the poet and his or her new realities labor against the weight of the world – and their own humanity. Directed by Brian Smith, The School of Creative and Performing Arts’ production of Howard Brenton’s Blood Poetry is an engaging spectacle supported by strong performances. Brenton’s Bloody Poetry follows the strange company of Percy Bysshe Shelley (Brett Tromburg), Mary Shelley (Fatima Zaroual), Claire Clairmont (Onika Henry) and Lord Byron (Connor WIlliams). The scandalous nature of their private lives – Percy abandoning his wife Harriet Westbrook (Bianca Miranda) for Mary – has made them social outcasts of 19th c. English society. Starting their lives anew in Switzerland, the crusaders for revolution chase their vision of utopia. What ensues in the following years, however, is failure and disappointment – crushed spirits and broken hearts. Brenton is mindful of historical accuracy, but, at the same time, he is not afraid to push those limits to explore serious questions about the relationship between poet and society. Percy concerns himself with writing about social injustices, supporting the people’s struggle through verse; he thinks himself to be the voice of the people. But of what value is the poet in a world so cruel, where massacres continue and the people bleed for revolution? Ideas, talk, (words, words, words) – what the world needs is action. Interestingly, Brenton shows us the early blueprints of what will eventually become one of Mary’s most famous works – Frankenstein. A thematic reminder of the poet as reject, struggling to find his or her place in the world. Lighting designer Kerem Cetinel’s work is phenomenal. The set – designed by Patrick DuWors – is clean and effective for the theatricality of the piece. The company uses a long white sheet to simulate ocean waves. The sound of crashing waves though overpowers the actors who are shouting to be heard. In the process, we lose some of the actors’ dialogue – an unfortunate shortcoming of an otherwise great scene. 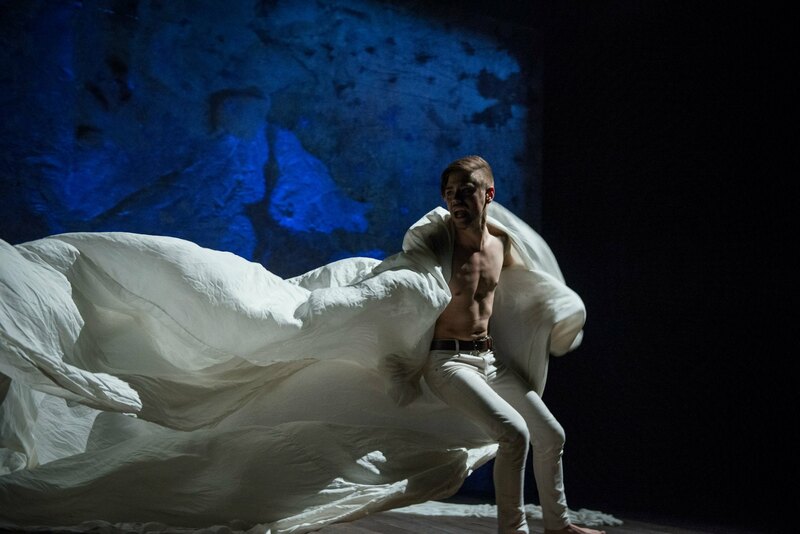 Where the technique is particularly effective though – as Miranda and Tromburg demonstrate – is when the sheet serves as an extension of the body – a visual representation of the character’s inner turmoil. Williams captures our attention with his entertaining rock star flair – no doubt inspired by Keith Richards. Given that, Williams’ dark eye makeup feels unnecessary given the already dominant presence of the character. Tromburg is commanding in the play’s second act, although his anger rings hollow at times. Zaroual and Henry are hesitant with their lines when we first meet them. Fortunately, the pair come to hold their own as the play goes on. Zaroual stands out with her quiet intensity – which makes one of her character’s final moments hit especially hard. On a whole, the actors work very well off each other. They commit themselves to the demands of the script and, together, bring an edge to Brenton’s already sharp script. SCPA’s production of Brenton’s Bloody Poetry is sure to entertain with its brilliant script, visuals, and strong ensemble. The School of Creative and Performing Arts production of Howard Brenton’s Blood Poetry runs Nov. 25-Dec. 6, 2014 in the Reeve Theatre (University of Calgary Campus).